What data can I get from Facebook? Our Facebook connector supports two types of metric sets: "Regular Metrics" and "Non-aggregatable Metrics". You can read more about "Non-aggregatable Metrics" here. First off you choose your level of granularity. By default, Campaign is selected. Selecting Campaign will only give you Campaign level data. Select Ad level if you want ID and Name for all your Campaigns, Ad Sets and Ads. Non-aggregatable metrics are valid for the selected level and time window only. Selecting Ad Set and 14 Day means you will be able to see Reach and Frequency at Ad set level, and each value represents the last 14 days (inclusive). Breakdowns refer to the breakdown found in the Ads Manager interface. In some cases you can select several breakdowns. Not all breakdowns are compatible - this is reflected in the dropdown. View your data by age range. These values are estimated. View your data by gender. These values are estimated. View your data by the country where people live or were located when they saw your ads, depending on how you set your location targeting. These values are estimated. View your data by the region (such as state or province) where people live or were located when they saw your ads, depending on how you set your location targeting. These values are estimated. View your data by the designated marketing area (DMA) region where people live or were located when they saw your ads, depending on how you set your location targeting. A DMA region represents a U.S. media market or an area reached by TV, radio, newspaper or other media. If ads were delivered outside the U.S., data will appear in the Non-DMA Region category. These values are estimated. View your data by the devices people were using when they saw your ads. These values are estimated. View your data by platform where your ad was shown (ex: Facebook, Instagram). These values are estimated. View your data by placement where your ad was shown (ex: Facebook desktop News Feed, Instagram mobile News Feed). These values are estimated. View your data by product ID. Product ID data is only available for ads connected to a catalog. These values are estimated. View your data by the reactions on your ads or boosted posts. The reactions button on an ad allows people to share different reactions on its content: Like, Love, Haha, Wow, Sad or Angry. These values are estimated. View your data by the URL people went to after clicking on your ad. These values are estimated. View your data by whether a video view was auto-play or click-to-play. These values are estimated. View your data by the devices people were using when they took any actions as a result of your ads. These values are estimated. Not finding a breakdown you are interested in? Please contact support. We're interested in your use case! When selecting a breakdown, make sure it's compatible with your ad account and the metrics you wish to see. Product ID only works with Dynamic Product Ads (DPA). If you select it when connecting an account containing some or all non-DPA:s, you will only see a subset of your data. Video metrics (3 second views excepted) are not compatible with breakdowns Region and DMA Region. Our connector downloads metrics based on attribution setting of your choice. By default, Facebook picks 28 Day Click and 1 Day View (Bottom right in the picture). If you're looking to view your data with different Attribution window models or breakdowns, please create an additional source of the same configuration but with your desired attribution windows or breakdown settings. Note: doing this will give you multiple costs/clicks/impressions. Be careful when you're summarising. It's possible to download additional metadata of the ad creative, such as link. Tick the Ad Creative checkbox and the dimensions will be added in your account. The URL that the call-to-action button or link in your ad directs people to. That value is set to 0. It is important to note that Funnel will only download data for actual Facebook campaigns. This means that, for example, Likes registered on a regular non-boosted post will not be found in Funnel. Each Page Like, Post Share or pixel conversion must be associated with some form of paid advertising on Facebook. 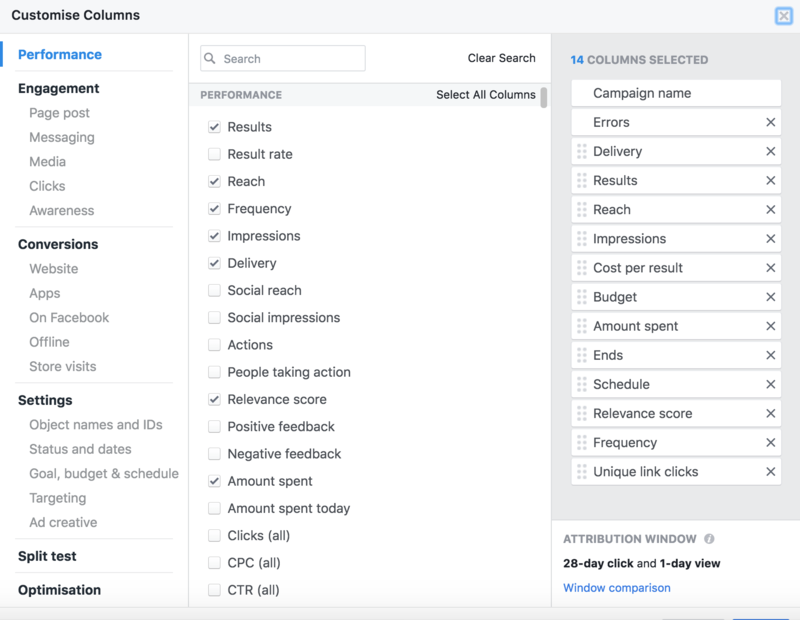 To view all the Facebook metrics that are available to you once you have connected your Facebook account to Funnel, head to the Metrics section and review the extensive list found there. Note: just because the metric is supported by Funnel, does not mean that you are necessarily registering any data for it in your Facebook account!